The Colors Of Indian Cooking: Cook Beautiful, With Clay! I cook everyday. Usually what I'm involved in cooking is lunch which is our main meal of the day. Dinner is an apple, or nuts and cheese or any combination of the three. Since we write every weekday I'm used to cooking in my jeans and a sweater or fleece jacket; since I'm just going back to the office it's a working style meal. But the weekends, the weekends are for entertaining. I love to have guests for a weekend dinner. I love setting the table just so, planning all the courses of an Indian feast, and I always have this image of sweeping into the dinning room looking all swank and cool and relaxed and joining my guests with every hair perfect etc. The reality is slightly different. I usually plunk down at the table still swathed in a long black apron covered with floury handprints and turmeric spatters. My hair is going every which way or has totally frizzed up from the steam. I may even be sporting a bandage or two depending on how careful I've been with my knives. Generally not a glamorous look. I always mean to put on some lipstick and take off my reading glasses but somehow never get around to it. They're usually perched on the end of my nose, which is why no dinner party pictures that appear on this website ever feature me. It's too scary. Until I made my major dinner beauty discovery.....clay! Now I've talked about clay before and I've cooked with clay before , but I never really appreciated how convienent clay can be until just recently. I prepared the infamous goat biryani for Alan's birthday a couple of weeks ago in my Eygptian bram. I had such a good time with that one that I took another of my clay plots and decided to slow cook a North Indian lamb dish for Alans' cousin Joans who visited us this last week. This time I used my Pomaireware red clay pot. The dinner party was on Monday, so I cooked the lamb slowly in clay on Sunday afternoon. The secret of cooking in clay is a long slow cook , then an overnight rest in the fridge in a pyrex bowl followed by de-greasing. Degreasing was explained to me by famed cookbook author and Queen of clay pot cooking, Paula Wolfert. Mellowing the cooked dish overnight enriches the flavors, and by next morning all the fat and grease have risen to the top of the dish and can be easily flicked away with a spoon. When the dish is re-warmed and cooked, it has retained all the full flavor of the cooking process but none of the fat. I've tried it and trust me it works! The dish I was preparing was Saag Gosht or Lamb with Spinach, a traditional north Indian dish. I started with 2 lbs of lamb shoulder block chops cut into 6 pieces, bone in by the butcher. When they turned color I took them out and then placed both the coriander and cumin seeds in a spice grinder and ground them to a fine powder. Set this spice mix aside for later. 3.) 3 Tbs of vegetable oil over a low heat. Put in your cut up pieces of lamb. Fry them, turning them until they're slightly browned. Then remove them and set them aside. Bring this mixture to a boil then reduce your heat, cover your pot and let it all cook for about 2 hours or so until the meat is very tender. Take the lid off of the pot. Most of the liquid should have evaporated. Cooking my lamb in clay there was still water in the pot so I removed the lid and continued to cook it down until I had a thick sauce. Add salt to taste. By this time, the meat was falling- off- the- bone tender. I let it cool in the pot then transferred the lamb and sauce to a pyrex dish to stash in the fridge. My cooking of the main dish was nearly done. I took the dish out of the fridge and with a long spoon removed the layer of fat and grease that had hardened on the top. When I was ready to cook, I brought the lamb to room temperature then put it back in my clean clay pot to slowly warm. I let it cook on a low heat with the lid on for another two hours while I got the rest of the meal ready. I was actually able to dress like a human being and get my hair combed and put on some lipstick. I didn't bust a sweat. About an hour before dinner, lightly steam 1 pound of baby spinach. Press the water out of it between paper towels and chop it up. Add it to the lamb dish. Stir it in . Replace the lid on the pot and you are done baby, done. I served this main dish with rice with whole spices and peas and cauliflower cooked with potato and tomato. Of course I tossed in chapattis and a raita. The reason this was a winner for me: The cauliflower could be made ahead and kept warm in a low oven. The rice finished along with the lamb dish. The raita was made hours ahead along with the chapatti dough, and of course the finished chapattis take just a few minutes to cook. I actually looked like a human being sitting at the table. Where does one get clay pots? All over the place. Usually I turn to the internet. On this webpage I have several listings of places where I've shopped and that I like. So now I'm a total clay convert, not that I wasn't before..but still. For eons clay has been a beauty treatment. Women have slathered their faces with it. For me, I think it works even better on the stove top! What a gorgeous clay pot and the lamb sounds really wonderful! Looks scrumptious. Just out of curiosity, something I've been wondering, why clay instead of just using an enameled cast iron Dutch oven? You did this on purpose so that I now need to go get one of those clay pots. Your meal looks amazingly good. @janis, you do you do. surprised you don't have one yet! Thanks for making us aware of your marvelous site. 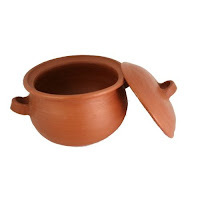 Are there any pots that we could make (our flameware will go on direct stovetop heat)that would fit for Indian cuisine? We're working towards a lidded casserole much like the earthenware pot you made the lamb in. Wow this looks fabulous, glad I saw this no since I tried my pot and screwed it up after reading some of your tips. I never read instructions! I think I may have fine crack lines ugh! But this lamb looks mouth watering as I am certain it is cooked slow and in clay...I can just imagine the flavors cant wait to try this! I love clay! I miss making pots! Food looks delicious. Hey Kathy - Did you ever figure out how to fix that foodbuzz code?? I have never cooked in a clay pot - looks incredible though. The flavors make my mouth water! This is a magnificent work! I have always wanted to learn more about Indian food. Looks like I came to the right place. Must. get. clay. pot. I can relate to the whole band-aid thing ... I usually burn myself at least once cooking dinner!